Apprentices win Gold & Silver at WorldSkills UK 2017! WEC Group apprentices win gold medal at WorldSkills UK in Construction Metalwork for third year in a row. 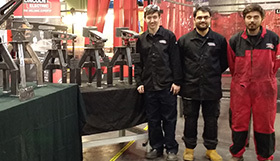 Two of WEC Group's Training Academy apprentices have won gold and silver medals at the prestigious WorldSkills UK competition in Construction Metalwork, making it the third year in a row the company’s apprentices have won gold. 25-year-old Michael Grimshaw, a second year welding and fabrication apprentice, won the accolade after beating off stiff competition at the three day final which was held as part of the Skills Show at the NEC, Birmingham from 16 – 19 November 2017. Third year apprentice and last year's WEC Group Apprentice of the Year, Tyler Atkinson, brought home the silver medal in his fight to compete at WorldSkills Russia 2019 as part of Squad UK. Reece Embley, the third WEC apprentice who made it through to the final 10 also received Highly Commended. Steve Hartley, Managing Director or WEC Group said: "For a local family owned business to produce national gold medal winners 3 years running is a major and fantastic result. It is a testament to the high level of training our apprentices receive, being recognised as some of the best and most skilled apprentices across the whole country." The three WEC Group Training Academy apprentices competed against over 100 entrants from across the UK in order to secure their places in the final 10. WEC work in partnership with Themis at Burnley College to deliver an award winning Apprenticeship programme. Director of Themis, Simon Jordan, said: "Congratulations to Michael, Tyler and Reece on a truly outstanding achievement. Their success in this renowned international contest is testament to their skills, commitment and determination to be the very best they can – all attributes we look for in Themis apprentices." Kris Mercer, Training and Development Manager, held weekly welding/fabrication master classes with the finalists in the run up to the competition, teaching them new skills beyond the baseline of the traditional apprenticeship framework. Kris said: "I am extremely proud of what all the apprentices have accomplished. This is a huge achievement and is a tribute to the investment by WEC Group in our apprenticeships and training frameworks, as well as the effort put in by the lads themselves." The standards of the competition were extremely high again this year, although the competition was more challenging than in previous years. Apprentices had to make both sections of a metal crane in the same time scale as previous competitors had to make one section. Michael started his welding and fabrication apprenticeship only 12 months ago, at an older age than most, after beginning a career as a steeple jack. As the job was seasonal and he wanted a career with more stability, he secured an apprenticeship with WEC Group where he will be guaranteed a job upon completion. Despite having the least experience out of the final 10 competitors, he still managed to win gold and now has a bright future ahead of him after starting his apprenticeship at WEC. Michael said: "It has been a fantastic experience and I am honoured to win a gold medal, it is a shame due to my age that I can’t be part of Squad UK, but I wish Tyler the best of luck!" He joins WEC Group's wall of fame alongside the other 5 apprentices who have won gold, bronze and silver over the past 3 years. 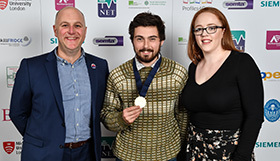 Thomas Woodburn, also a welding/fabrication apprentice, was the gold medal winner in 2015 and still holds the record for the highest score ever recorded in the competition so far with 93.5%. WEC Group's in-house Training Academy provides traditional five year apprenticeships to local individuals in welding/fabrication, CNC machining and technical production engineering as well as recently expanding to other areas of the company including CAD programming, business administration, IT and marketing. We also employ apprentices in Rotherham, Knowsley and Sherburn-in-Elmet. If you would like to kickstart your career in engineering at WEC in 2018, please send your CV to recruitment@wecl.co.uk.